With Edinburgh as its hub, the combined area of West, Mid and East Lothian once hosted a considerable railway network. During the nineteenth century, competition between the Caledonian and North British railways was intense and many lines and stations were built which were never meant to be viable. A prime example was the overly pretentious Leith Central Station. On the other hand, the activities of the railway companies did result in the engineering triumph of the Forth Bridge. By the 1920s bus services were impacting the railways' profits and by the 1960s many lines were dismantled by the Beeching cuts. 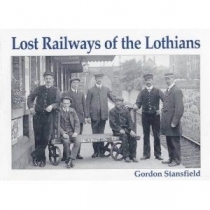 Edinburgh especially suffered and virtually all of its suburban services disappeared. They are remembered in this history of the Lothian railway networks, enhanced by fifty-two authentic period photographs.